It has been called monstrous and innovative, a monument to Gehry’s ego and a fitting tribute to a humble war hero and president. But one thing that both its detractors and champions seem to agree on: the site is just too damned big. Located where Maryland and Independence Avenues meet in downtown D.C., the planned memorial site is four acres, roughly the size of four football fields. Gehry had no hand in selecting or defining it. 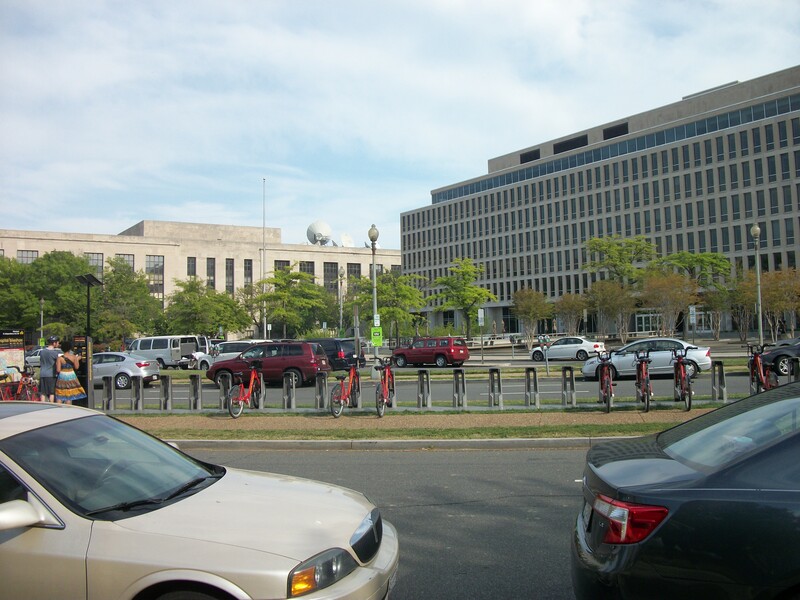 The National Capital Planning Commission identified it years ago as suitable for a memorial, and then another federal body, the National Capital Memorial Advisory Commission, approved it specifically for the Ike memorial in 2005. Gehry didn’t come on the scene until 2009, when he beat out Rogers Marvel, Peter Walker, and Krueck & Sexton for the plum job (or so it must have seemed back then). Should Gehry have reined himself in–made do with one or two acres instead of four? Even the Washington Post’s Roger Lewis, a vocal critic of Gehry’s proposal, has conceded that that idea is not very realistic (scroll down to 12:28 in this transcript of The Kojo Nnamdi Show). Give an architect a site, and he’s going to produce a design for it–all of it. I stopped by last weekend and took some photos. It doesn’t feel as vast as I’d expected, partly because Maryland Avenue bisects it on the diagonal (it’ll be closed off when the new memorial is built). But the internal road makes the “square” feel all the more disjointed. The main attraction is the Department of Education Plaza, so forlorn and dysfunctional that it’s been inducted into the Project for Public Spaces’ Hall of Shame. 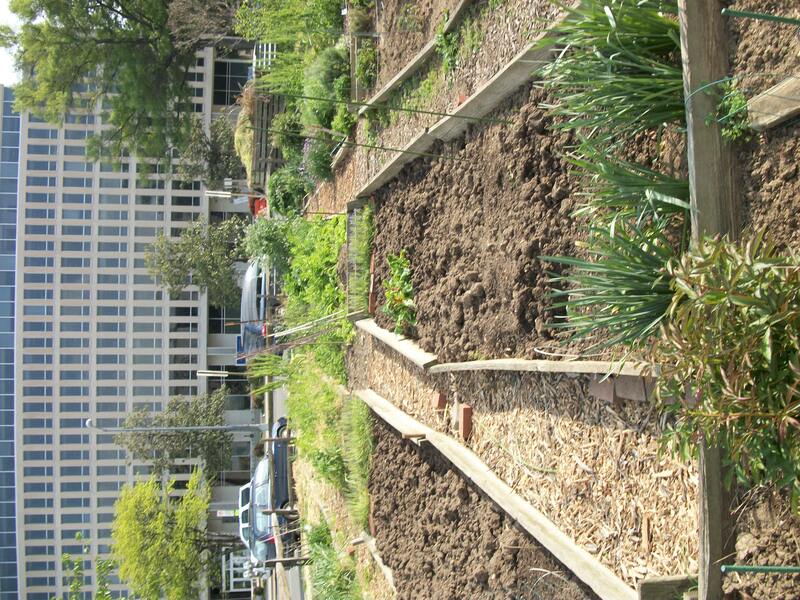 The site does have two redeeming smaller features: a Capital Bikeshare station and a well-tended community garden. It’ll be a shame to lose the garden to the sweep of Gehry’s design. But bikes and flowers don’t make a place Amsterdam. The tract could use some love, and a new memorial park should help revive it. Four acres, by the way, is the same size as the Vietnam Veterans Memorial. I had no idea that this is where this whole Gehry hulabaloo was taking place. I kind of like those community gardens…at least they could throw us a bone with some more flowers or flower beds in the memorial layout–kind of bare as it is with just trees. Maybe Ike wasn’t a flower person though…Thanks for checking it out and sharing your thoughts. That, “Gehry didn’t come on the scene until 2009…” is untrue. 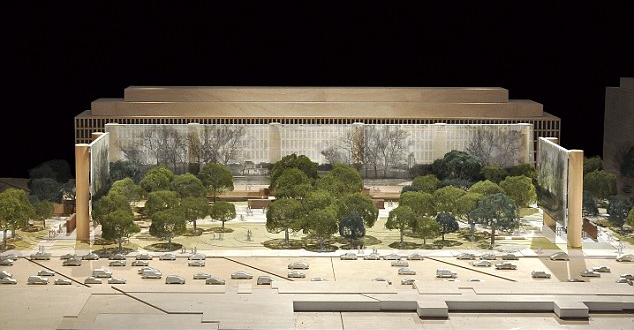 The Eisenhower Memorial Commission’s, Rocco Siciliano in the Commission’s 2001 minutes stated that the Commission wanted an architect like Gehry; before the architect was chosen Siciliano again said–as stated in the Commission’s minutes–that he spoke with Gehry about doing the monument; earlier, before the Commission existed, Siciliano went to Congress with the long history of his Gehry association proceeding him: The minor question is, “Did Siciliano create the Commission to honor Eisenhower or did Siciliano create the Commission to secure a position for Gehry? The major question does not concern a random four acres; the question concerns four acres in the heart of the Nation’s Capitol, in the context of L’Enfant’s plan, in the character of memorials fitting to national heroes. Hi Michael, thanks for your comment. It’s certainly true that Rocco Siciliano did have a previous association with Frank Gehry, and Gehry’s name had been floated in discussions about the memorial from quite early on. But as the world’s most famous architect, it’s not surprising that his name would come up. He didn’t have any formal involvement until he was longlisted with 43 others. (That might have been 2008, not 2009.) It’s impossible to know the motivations of Siciliano or Gehry, but I think it is safe to say that Gehry didn’t need this commission — not by a long shot. And while these four acres are not “random,” and more significant than the usual urban space, I don’t think it’s unreasonable to ask the same questions we would of any major redesign proposal: what’s the site like now, and will it be made better or worse by the plan?